Directorate General of Special Education, Punjab Government has issued a Notification regarding Instructions of Social Media Strategy by Officers of Special Education on 22-09-2018. 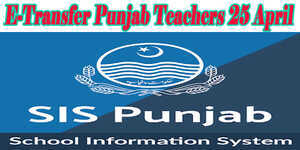 It is directed that Authority has shown grave concern regarding complaints received related to taking snaps or videos of employees working in special Education Institution especially female teacher and uploading the same on the internet through social media. 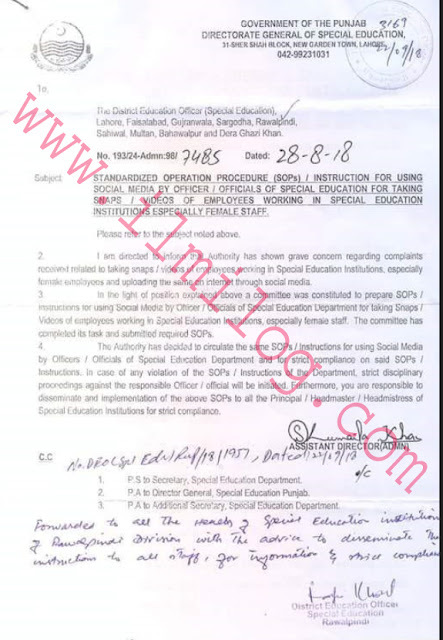 In the light of position explained above a committee was constructed to prepare SOPs or Instruction for using social media by officers/ officials of Special Education Department for taking snaps or videos of employees working in Special Education especially female staff. The commission has done its task and succumbed SOPs. The Expert has decided to socialize the same SOPs /instructions for using Social Media Strategy by officers of Special Education and for strict obedience and said SOPs/ instructions. In the situation of any endorsement of the SOPs /Instructions of the department severe punitive proceeding against the guilty officers.